Houston • The Jazz wanted to change the terms of engagement. James Harden is perhaps the best offensive player we’ve seen since Michael Jordan, averaging over 36 points per game on a stepback three — nearly 10 points per game on that unguardable shot alone, which he makes 39% of the time — and with a relentless parade to the free-throw line. “He’s always been a hell of a player. Even in OKC in limited time, coming off the bench, it was really effective,” Thabo Sefolosha said after Monday’s film session. "You can see that now, the way he dissects the game, understands the defense, and picks it apart, it’s pretty unique. Utah knew that if it allowed Harden to do what he does so well, it would lose the series thanks to Houston’s vaunted, league-leading offense. So the Jazz decided to go with a defense that the NBA hasn’t ever seen for any other player: take away his stepback three by tip-toeing to the left and even behind Harden to prevent the stepback shot. That gives Harden a wide-open path to the basket, and as devastating as his stepback three is, the alternative was worse on Sunday night. Over and over again, Harden found his teammates for open shots, whether it was Clint Capela at the basket for lob passes or P.J. Tucker and Eric Gordon for 3-pointers. And it’s there where the Jazz need to provide more resistance. Sure, the strategy means that Gobert has to step up in the paint to stop Harden, but he’ll need help to prevent the dunk behind him. And when he receives that help, the Jazz need to do a better job of defending the 3-point arc, even if it is a temporary 2-on-1. Whoever guards Harden can do more to stay attached with the NBA’s leading scorer, so it’s not quite so easy to throw that pass. You have to send Harden to his right to the entire drive, not just allow him free rein after one right-handed dribble. Sefolosha’s right. The Jazz have focused on shading Harden right before. But they haven’t ever done so to this extreme, where they’re actually even sometimes behind him as he operates, even as soon as half court. As was clear by the final score, Harden wasn’t phased by the scheme. He doesn’t really put credit for that on the Jazz’s defense, but on his own abilities. To Harden, there’s nothing that the Jazz could do that could stop him. 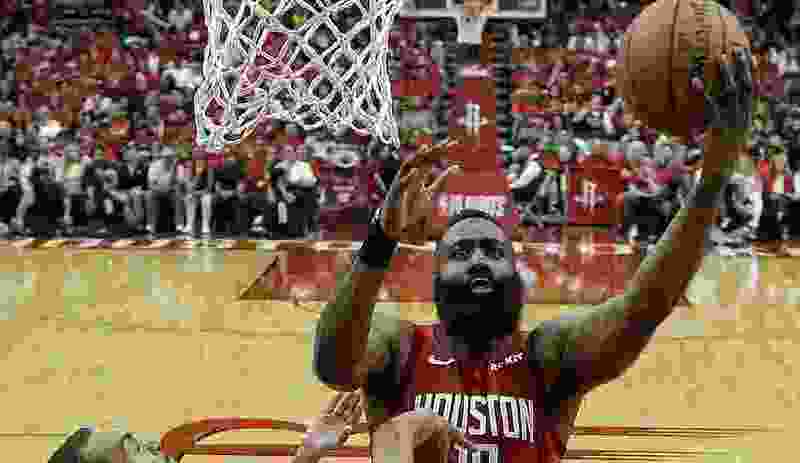 “I’ve seen literally every defense you can possibly see, so it’s just a matter of adjusting and continue to communicate with the guys and what spots they need to be in, and that’s pretty much it,” Harden said. The Jazz say that they can make life more difficult for Harden, though, and that they will in Game 2. They’ll base it around the same basic gameplan of limiting Harden’s efficiency, but they’ll need to improve everything else to have a chance to win. That confidence in each other means that, despite the 32-point loss, the Jazz are keeping their spirits high for Wednesday’s Game 2.